My husband is a true blue meat and potatoes kind of man. His mom always jokes that he doesn’t eat anything green. The funny part is that before I met my husband I didn’t eat meat so like everything else we were on opposite ends. It’s funny when I think back to when we first met because we were so very different from each other and that whole “opposites attract” definitely applied to us. The crazy part is that we have definitely gained some of each other character traits. Eating meat is definitely one for me and he actually eats things that are green now. This recipe is meant for my husband. It takes my Pulled Pork Loaded Baked Potato and turns it into a soup. 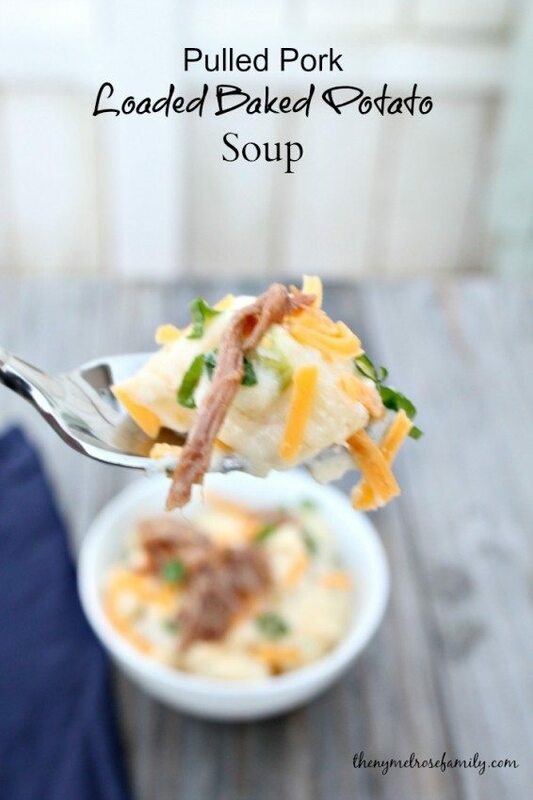 You certainly can’t go wrong with this Pulled Pork Loaded Baked Potato Soup on a cold, wintry day. 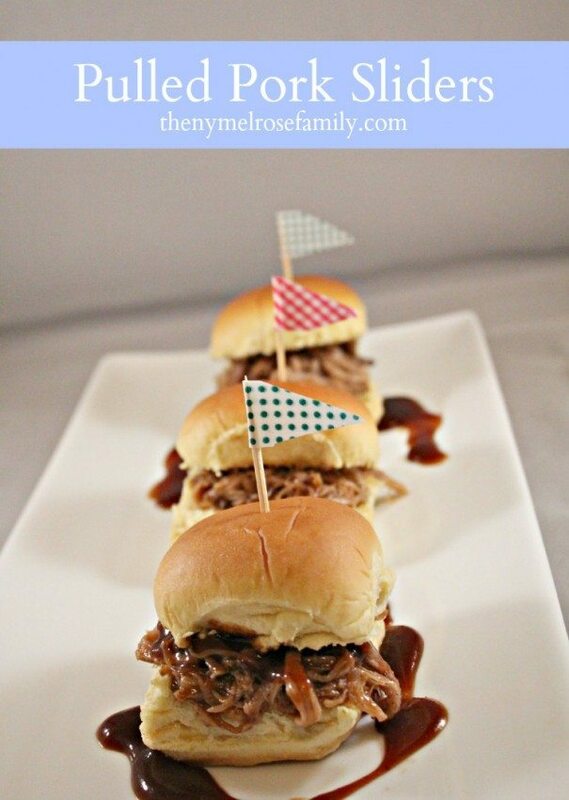 Our Crockpot Pulled Pork is a favorite any time of the year and I love finding ways to use the leftovers. We always have leftovers since the girls continue to have aversions to meat. I can’t say anything since I didn’t eat meat for so long and I’m hoping that it’s just a phase and that their taste buds will mature with age. They are definitely missing out since our pulled pork is such an explosion of smoky flavor. You know that it’s a good recipe when the aroma of it fills the house and you don’t want to leave the house because it smells so good. 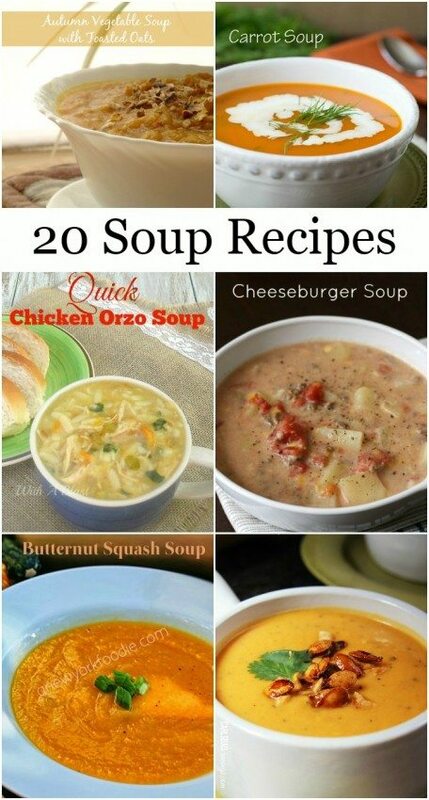 I combine all of the ingredients in the soup and then top it with a sprinkle of cheese, chives and pulled pork. 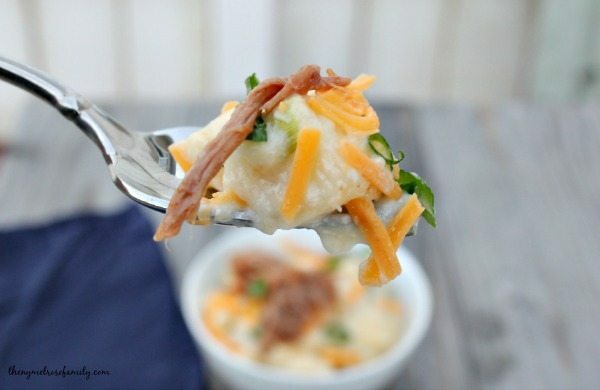 It’s the perfect flavor combinations of smoky and creamy in one bowl. You just can’t go wrong with it. In a skillet melt the butter and whisk in the flour until browned. Add in the milk to the butter and flour mixture mixing constantly until it thickens a bit. Add in the the chunks of potatoes and bring to a boil. Reduce the heat to a simmer and allow the potatoes to cook until they are soft. Add in the sour cream, salt & pepper, cheddar cheese, chives and pulled pork. 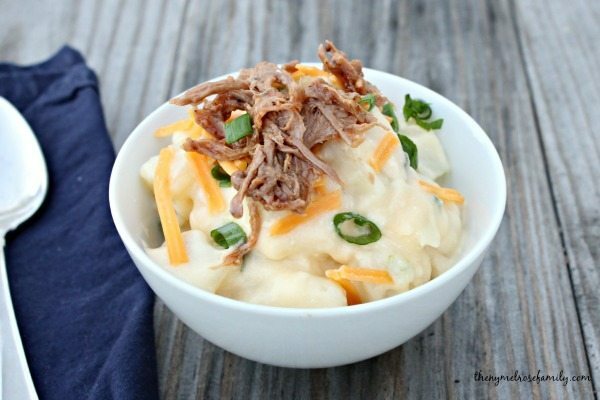 That pulled pork baked potato soup looks absolutely amazing! Maybe not so good for my girlish figure but who cares…I’m making it!!! Holy stick a spoon in that!